A project with young people about their experiences of being homeless. We talked to young people who had experienced homelessness to hear what they had to say about homelessness services. Complaints we had received highlighted issues with these services, particularly the HSE out-of-hours and crisis intervention services for children and young people who are homeless. We spoke face-to-face to 15 young people from different services in Dublin and in Cork to hear their experiences of being homeless. Read more about how we came in contact with these young people in our report. This video highlights some of the issues that young people told us about their experiences of being homeless. 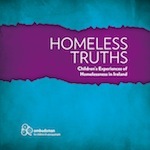 We wrote a report called ‘Homeless Truths’, which was published in 2012. The report made many recommendations to government on how to improve matters for children and young people experiencing homelessness. We highlighted the issues faced by homeless children on a national level to the Oireachtas, and on an international level to the UN Committee on the Rights of the Child. Although there are still many children and young people facing homelessness today, this project gave a voice to these young people who can be hard to reach and allowed them to have to their say.